I recently had a patient who had a bad treatment outcome. When he asked me how I was sure we would be able to get sperm, I told him if that sperm were being produced in the testes, they will not disappear; and we will be able to use these for ICSI. A diagnostic testis biopsy samples tissue from just one part of the testis ; and if that was reported as being normal, this means the chances are extremely high of sperm being normally produced in the entire testes. Our chances of being able to recover these is very high, as we do multiple microbiopsies when doing TESE. In fact, we have never had a patient with normal spermatogenesis for whom we have not been able to find testicular sperm when we do TESE ICSI. His testes were completely normal on clinical examination, and we started the TESE with lots of confidence. When we sucked out testicular tissue through a needle, we got lots of tubules, and we sent it to our embryologist , Dr Sai, in the adjoining IVF lab, being pretty sure he would find lots of sperm. However, when Dr Sai started start dissecting the tubules to look for sperm, he found to his dismay that there were none. There were a lot of tubules and plenty of testicular content, but there were no sperm at all in it. We took 3 more biopsies from the other side ; and 3 more from the first side , but the results were the same. There was no technical problem, and there was a lot of content in the testicular tubules we sent Dr Sai, but there were no sperm in the tissue. He dissected the tubules carefully; centrifuged the content to concentrate the tissue in small droplet of culture medium under oil; and then sperm hours examining the tissue meticulously and diligently , looking for sperms . However, no matter how hard we looked , we could find any. This came as a rude shock to us and I had to go back and explain to the patient that we hadn’t been able to find any sperm. He was understandably upset - but I was even more upset , for multiple reasons . I had promised him something, and had not been able to deliver on my promise. I was upset that my clinical assessment had been wrong, and that I had failed to discuss the option of using donor sperm with him , in case we did not find any testicular sperm. My overconfidence had let to this sad situation, leading to a loss of face for me. Also, he was now forced to make a decision to use donor sperm – something for which I had not counseled him, which meant that he was not properly mentally prepared for this. I kicked myself for not having discussed the possibility of having to use donor sperm in case we didn't find any testicular sperm on the TESE with him. If I had done so, then even if I hadn’t been able to find testicular sperm, I wouldn’t have been so upset, because I would have prepared him mentally for this eventuality. As a surgeon, I was confident that technically no one in the world could have done anything more for him. The procedure had gone off perfectly , and the fact that we did not find any sperm was a result of the fact that there weren’t any sperm in his testes. He had complete testicular failure, and the pathologist had done a poor job with reporting the earlier biopsy as showing normal spermatogenesis, a misleading report which ended up causing me a lot of grief because I had trusted it. In retrospect, I should have sent the testicular biopsy slides for a second opinion to a reliable pathologist. The reality is that bad things do happen in medicine . 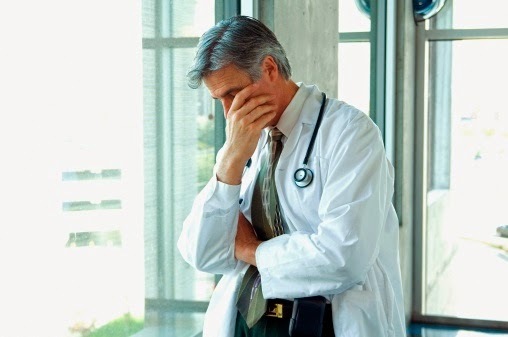 Bad things happen to good patients and bad things happen to good doctors , no matter what we do and how hard we try. It’s important to prepare contingency plans , and it's important to be open and transparent with patients , and make sure that they are well- informed and have realistic expectations throughout the process . This way, even when things don't go as planned , the patient and the doctor can make the decision which is in the patient's best interests . It’s only when doctors start hiding stuff and covering up bad outcomes that patients get angry and resentful. Be kind to yourself. It's ok to err. I am happy that the patient was kind enough to understand the situation. I hope doctors come forward to share their shortcomings so that patients have realistic expectations about medical science. Yes, we learn a lot from our mistakes - but it's rough when you have to live through them !